Somewhere between commissioning me to do a quilt and coming to a class - I knew there should be something, because I know that everyone has different levels of time, inclination and disposables. I also know that lots of you want to make it yourself, but it seems way too overwhelming. 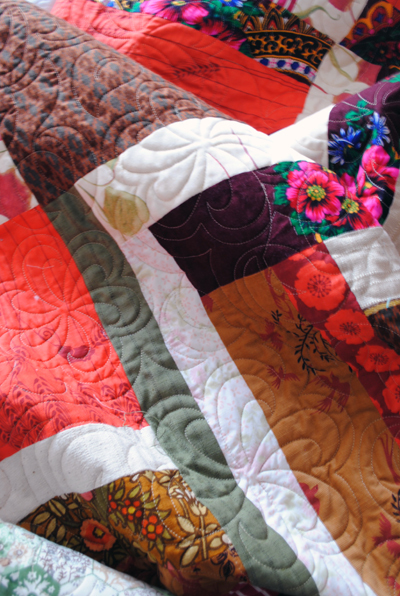 The perfect hybrid between learning to make your own quilt and commissioning my studio to make the quilt for you. Quite simply, up to three people can join me to make a quilt for their special occasion (birthday, wedding, celebration of life, just because you have always wanted to). I work with you beforehand to decide on the design and make sure that you have all the fabric and tools you need. We should complete the quilt top in a day. Cost: £275 for up to three people. This is a full day from 9.30am - 5pm in London and can be booked on a weekday only. The cost does not include fabric or quilting but this can be arranged for you. It would be a great day - I promise.